Each year the PDA sponsor the Student Leadership Award in the Northern Ireland, Welsh and Scottish Pharmacy Awards, which are hosted by Medical Communications. 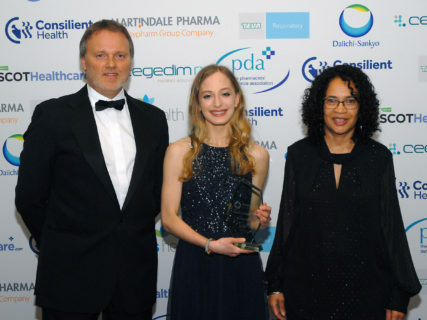 We caught up with Marie-Anne Durham, a third year Pharmacy student at Robert Gordon University (RGU), who won the Student Leadership Award at last years’ Scottish Pharmacy Awards, to see what has inspired her so far in her pharmacy journey. Marie-Anne, why did you choose to study pharmacy? Pharmacy allows me to care for people and improve their health using my knowledge of pharmacology and medicinal chemistry. It is the perfect degree if you are interested in the science behind medicines but enjoy working with people rather than in a laboratory. What is the main thing about pharmacy that interests you? I am interested in being involved with the innovations in healthcare which are transforming people’s everyday lives. The pharmacist acts as the interface between very sophisticated science and patients, which is a unique responsibility. The pharmacy is an environment where people have access to clinical expertise without the need for an appointment and it is often the first point of contact for worried patients. Pharmacists reassure by answering patient queries about their medication and use technology to provide healthcare in remote communities. How have you found your course so far? The course has lots of deadlines but very interesting lecture topics including management of different clinical conditions such as anaemia and rheumatoid arthritis. There’s also lots of group work from designing and manufacturing naproxen tablets to conducting a cardiovascular risk assessment on a simulated patient. This requires working in collaborative healthcare environments experienced in practice and actually knowing the names of all your course mates! What three tips would you give to students beginning their pharmacy course? Don’t limit your view of pharmacy to only two options: community or hospital. There are lots of different career opportunities such as working in GP practices, creating guidelines for best practice and independent prescribing. Your course mates will have the same deadlines and understand how busy the course can get so are the best source of support and will listen with sympathetic ears to your worries. There’s lots of science, particularly in first year which is general and not specifically related to providing patient care. It’s good to understand but you don’t need to become an expert in thermodynamics. It’s more important to get experience of pharmacy in practice either through working in community, placements or talking to qualified pharmacists in different sectors. If you could start your course again, what if anything, would you do differently? I would focus less on achieving perfect grades in science exams and more on gaining experiencing in different areas of pharmacy. Attending the International Pharmaceutical Federation Congress 2018 in Glasgow really opened my eyes to the myriad of opportunities available in pharmacy, at home in Scotland and globally, which I wish I’d known about earlier in my degree. What inspired you to work in the Vietnamese homeless shelter? The shelter was chosen by the organisers but through volunteering I became aware of how the isolation experienced by residents could be lightened by just spending time together, chatting and playing games. I was inspired by the way small gestures like smiling and listening could be very transformative and the importance of social interactions for improving health and well-being, not just nutrition and medication. How did you balance your time between studying and your extracurricular activity? Making a note of deadlines in your calendar right away is really helpful to make sure you don’t forget until two days before! Scheduled activities such as netball and yoga classes are good because they provide a regular routine. In pharmacy there are societies and events with a healthcare focus which are organised and attended by course mates. They provided the opportunity to learn new things outside of the university curriculum such as being taught by medical students how to suture synthetic arm wounds – not something you get to do every day! Have your experiences at university changed you as a person? If so, how? I have begun to develop my professional identity through interacting with qualified health professionals, scientific lecturers and working in community and hospital settings. I now feel part of a profession with an interest in innovative pharmaceutical science which also provides care to unwell and vulnerable people. I have become a more empathetic person, able to recognise patient needs and how I can help using my knowledge of disease pathophysiology and different pharmacological treatments. Our commitment to future professions means that we sponsor a variety of student events across the academic year. Feel inspired by Marie-Anne’s story? Did you know that many awards within the pharmacy calendar encourage self-nomination. The PDA offer FREE membership to students and pre-reg trainees to help them on their journey to become qualified pharmacists. Each year, we also donate £1 for every member we get to the profession’s charity Pharmacist Support, which works for pharmacists and their families, former pharmacists and pharmacy students to provide help and support in times of need. Last year this resulted in a donation of over £29,000.